From Goodreads: Hannah's parents are glamorous Hollywood royalty, and sometimes she feels like the ugly duckling in a family of swans. After her mother's tragic death, Hannah's grief is compounded by her desperate need to live up to her mother's image. She tries to control her weight through bulimia, and her devastated father is too distracted to notice. The secret of her eating disorder weighs heavily on Hannah, but the new eighth grade Beverly Hills clique she's befriended only reinforces her desire to be beautiful. The only one who seems to notice, or care, that something is wrong is Jasper, the quirky misfit. Thoughts on the Novel: Katrina Kittle’s Reasons to Be Happy is a book that explores the overarching theme of beauty. Juxtaposing Hannah’s North American life with the time she spends in Ghana, Kittle allows Hannah to realize that inner beauty and learning to accept oneself are much more important than outer beauty; and in the process, enables Hannah to see the little joys in life once again. 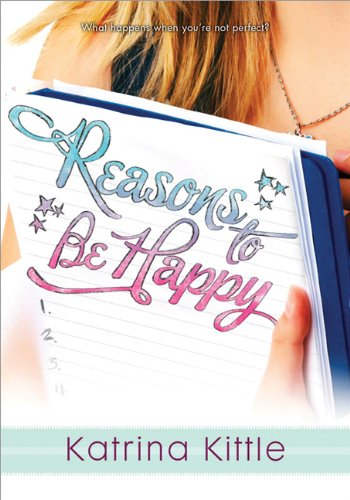 Hannah is a girl that anyone can relate to, especially tweens – the intended target of Reasons to Be Happy. Feeling like you don’t belong, wanting to be prettier and trying to please your parents are all things most people experience growing up, and Reasons to Be Happy definitely made me remember those times. To make herself better and regain some control over her life, Hannah however resorts to binging and purging. Kittle’s portrayal of eating disorders is very realistic and her vivid description of Hannah gorging on food – frequently stolen – and then trying to vomit it up sometimes made me nauseous. It’s often harder for people to notice bulimia because unlike anorexics, bulimics usually tend to be normal in weight or be overweight. Thus, nobody notices that Hannah seems to have a problem even as she desperately wants somebody to help stop her. A novel that will resonate with readers and leave them thinking about their own reasons to be happy, Reasons to Be Happy was released by Sourcebooks Jabberwocky on October 1, 2011. Comments About the Cover: The cover doesn’t really show that the book is about bulimia, and it’s kind of got a cheerful vibe as opposed to the book which has a more serious tone. In exchange for an honest review, this book was received from the publisher (Sourcebooks) for free. I need to get this one for my little cousin, but I'm afraid that she is at that stage where messages like this are completely lost on her. She is always going on about what her friends have and what she doesn't have. It saddens me. Still maybe this is one we could read together. Thanks for pointing out this book to me, Z! Thanks for bringing this book to my attention. I never heard about it before and the premise sounds promising. I was a bit surprised how the cover doesn't reflect the serious tones of the book. I'm going to put this one on my tbr pile. Thanks! Great review! Sounds like a deep book! I need to be in the mood for them but I usually enjoy them. I also see you're reading Ashfall - I LOVED that book!! Hope you're enjoying it! There were so many things in your review about Reasons to be Happy that I didn't know about. The cover is a little misleading since I wouldn't have guessed that there was a deeper story. This one sounds like an intense read. Never seen it before. I love the books that makes you think about their themes. Im adding this one to my list.